Kang Jung-ho hits two homers for the Pirates in spring debut. February. 26, 2019 07:49. by Won-Joo Lee takeoff@donga.com. Missed two seasons, but his talent was still there. So much so that Pirates’ manager Clint Huddle said, “This guy’s crazy.” In his first spring training match in four seasons after taking a break due to his drunk-driving, Kang Jung-ho of the Pittsburgh Pirates proved that he is still as good as he used to be by hitting consecutive home runs. 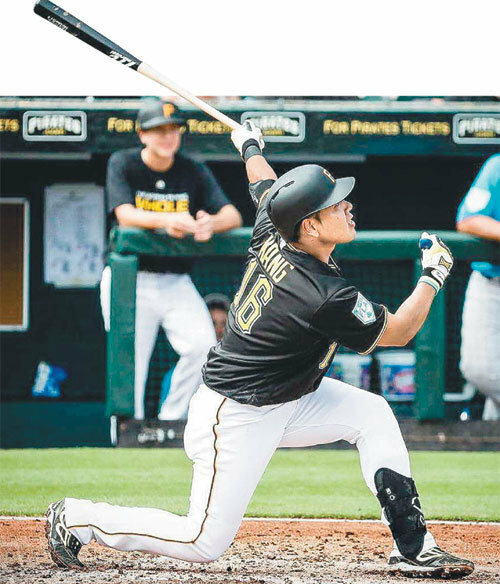 In the spring training match on Sunday against the Miami Marlin at LECOM Park in Florida, the South Korean third base man batted fifth in the lineup and hit homers in his first two at-bats. In the bottom of the second inning, when his team was leading by 1:0, Kang hit a leadoff home run off Trevor Richards, sending a change-up (134 km/h) beyond the left-field fence. Kang showed his trademark salute celebration as he circled the bases. On the same day, Los Angeles Dodgers’ Ryu Hyun-jin threw a one scoreless inning in his spring training debut against the Los Angeles Angels, heralding a successful season. It has been five years since Ryu started in February. Before coming to the U.S., Ryu met with fans in Korea and said his goal this year is to record 20 wins this season. Ryu’s presence in the club is growing even more as Dodgers ace Clayton Kershaw is not playing in spring training due to an arm injury.